Until the end of October, we will be revisiting our most popular posts from over the years. 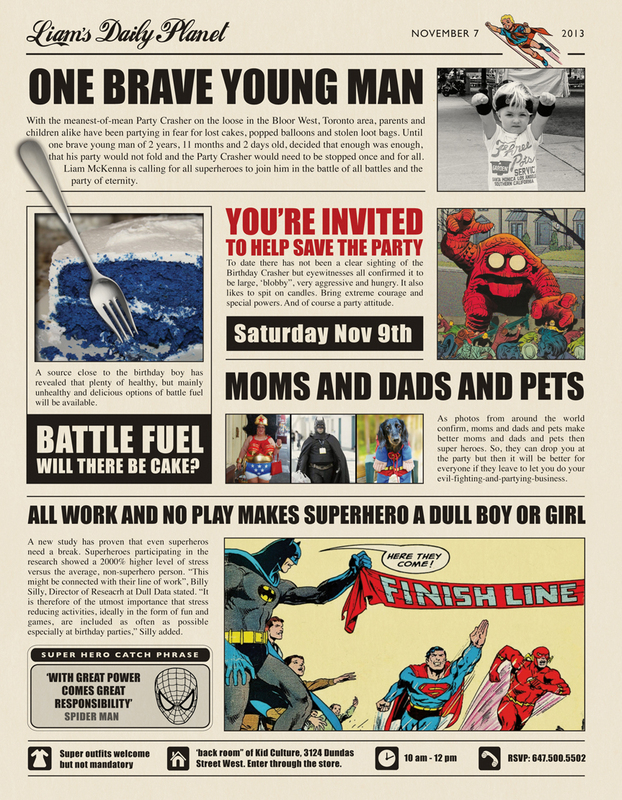 The number one most perused post is A Superhero Birthday Party by Liesbeth. This is actually a 4-post project, and links are included (on the bottom of this page) to the other parts. Enjoy! My son’s birthday is my favourite creative challenge. Trying to suggest any non-superhero theme got so much resistance that I, like every other parent of a 3-year old boy, had to give in. So I embraced the theme, but only if it could be old school. The elements of this party will be posted to the Motherboards in stages this week. Today, part 1: the invitation! COME SAVE THE DAY! Superman’s Daily Planet newspaper became my inspiration and though I have taken part of the vintage logo, I took creative liberties on the rest of the design. The fun with a newspaper design is that you can do so many things. Add little columns, specials, mock ads, etc.. I had so much content that I had to cut down on it and focus on the most important birthday information – providing parents and kids with the facts all wrapped in a fun theme. Have a close-up look at the front and back, as it speaks for itself. I designed my invite using Adobe illustrator and Photoshop but if you are not a designer you can also find Word templates or could create sections and print those, do some cut and pasts and photocopy the invite. The fun part about this kind of old newspaper is that it only gets cooler when the quality is slightly “off” and it has this vintage “print” feel. I printed these letter-sized invites at Vistaprint but you could get this done close to home at, for example, Office Depot. 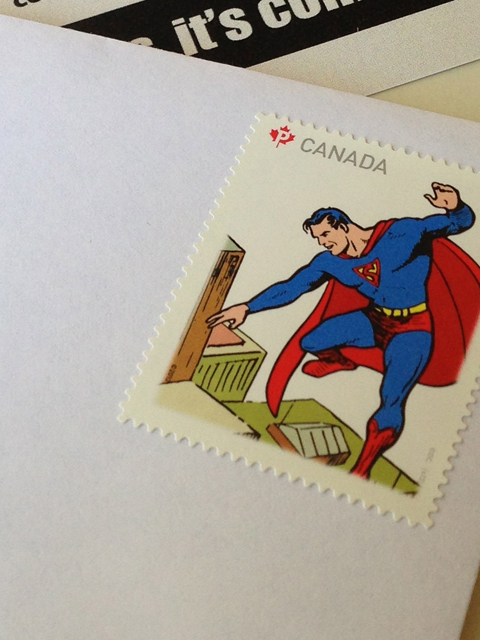 I was also so lucky to find Superman stamps at Canada Post (connected with the latest release of the movie) for those invites that had to go in the mail to out-of-town family members. We got a lot of reactions on the invites. The kids really liked them and many asked their moms to take them off the fridge over and over again to look at them. It feels good when you make something that is liked by your most critical customers. This is the perfect invitation! I’ve been scouring the internet for a template to use for my son’s 1st birthday coming up in August. Would you be willing to share your template? I’m making my own envelopes using old comic books we have, but I admit I’m not computer savvy enough to accomplish this! Hi Helena. So happy to hear you like the invite. I did design this with Adobe Illustrator and Photoshop from scratch which are designer software programs. Do you know how to work with those? Alternatively I can sent you the high resolution files and you create you custom pieces separately, stick them on top and color copy??? Let us know. Any help you could give would be so incredibly appreciated!! I was wondering, would you be so kind as to send me to high resolution files? I am so excited to try to get his invitations together!!! 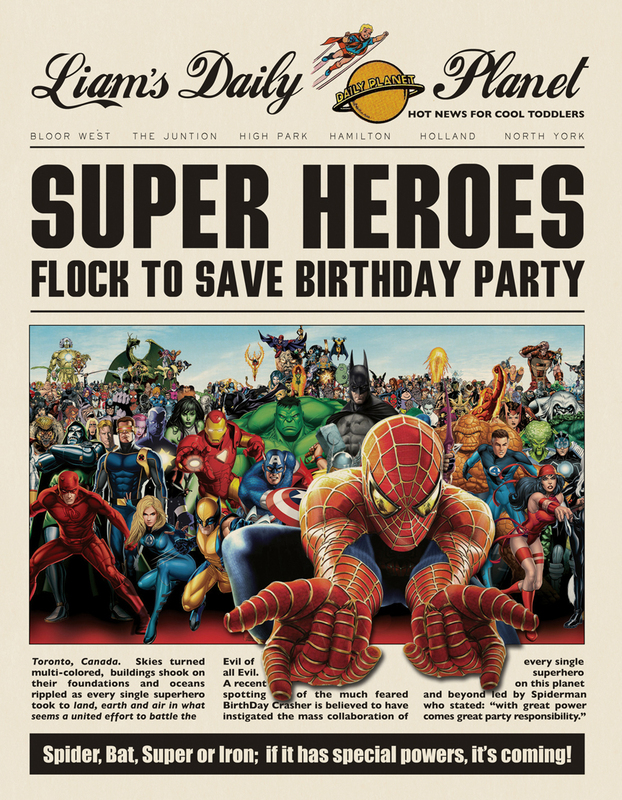 I have put them on a separate page for you at https://themotherboards.ca/high-resolution-files-birthday-party/ but also included the link now inside the post for any other people that might want to print those and do some cutting and pasting activity of their own. Good luck with it and please share your results with us!! I absolutely love this invitation!!! I would love to use it for my sons 5th birthday. I am willing to pay for the template:) Please let me know!